[T]he most important takeaway for American skeptics is that the policy basically worked as advertised. British Columbia’s economy did not collapse. In fact, the provincial economy grew faster than its neighbors’ even as its greenhouse gas emissions declined. It’s a great story, but unfortunately it’s fiction. Let’s start with GDP. True, BC’s economy did not collapse due to the carbon tax, but nor did it grow faster than its neighbours’. Here’s Statscan data for real GDP growth for the major provinces of Canada: between 2007 (the year before the carbon tax came in) and 2014, and between 2010 (the trough of the recession) and 2014. While BC outperformed Quebec and Ontario, its performance relative to its neighbours (Saskatchewan and Alberta) is much weaker. OK, but greenhouse gas emissions declined, right? Like other provinces, BC saw a recession-induced drop in emissions between 2008 and 2009, and a more modest drop in emissions in 2010. Another consideration is that when BC’s carbon tax was introduced in July 2008, fuel prices were peaking at around $1.50 per litre (in Vancouver, where I live), but the carbon tax was only 2.3 cents per litre out of that total. These factors – economic downturn and high fuel prices – better explain the drop in GHG emissions than the carbon tax, although arguably the carbon tax piled on. 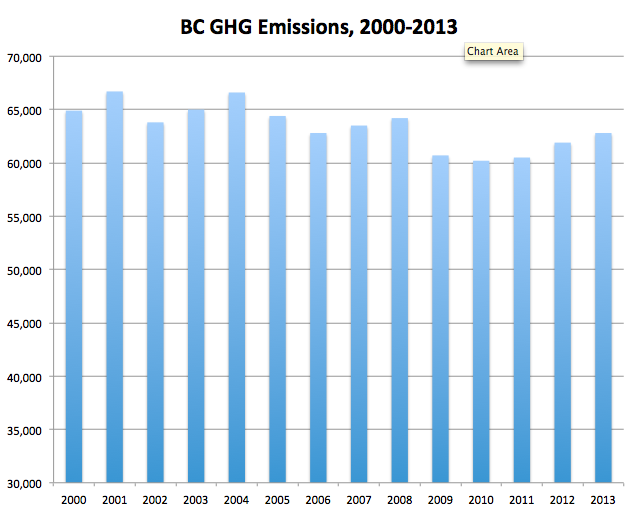 If you take 2007 or 2008 as your base year, then you can construct a story that BC’s emissions have fallen, but the reality is that since 2010, BC’s GHG emissions have increased every year; as of 2013 they are up 4.3 per cent above 2010 levels. More than two-thirds of this increase is attributable to the growth of BC’s natural gas industry (up 1.8 million tonnes). BC also recently conceded it will not be able to meet its 2020 GHG target. British Columbia’s carbon tax leads the pack: The Secretary General of the OECD stated, “British Columbia’s carbon tax is as near as we have to a textbook case” of effective carbon pricing. In the five years after it was introduced in 2008, the province’s per capita fuel use dropped 16%, while GDP growth kept pace with the rest of Canada. 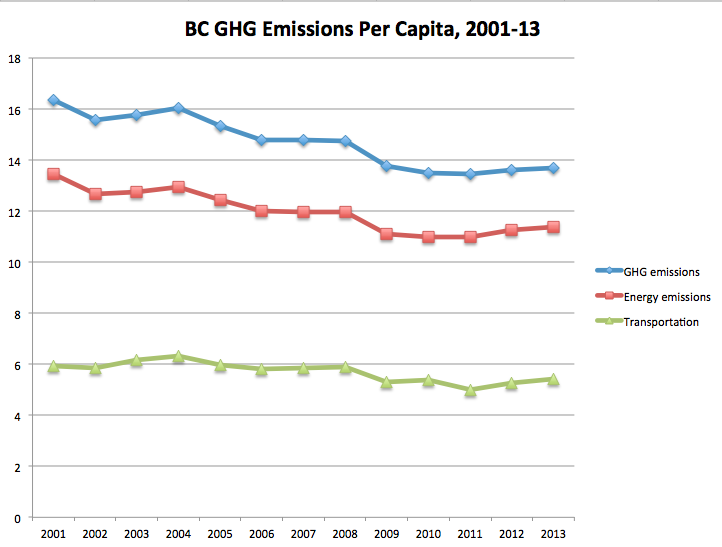 Interestingly, BC’s per capita emissions were on a steady downward trajectory well before any real action on climate change. This may be due shifts in industrial structure, and growing urbanization of the province’s population, and perhaps also due to other fuel taxes that preceded the carbon tax. This latter point bears some elaboration because fuel taxes are essentially carbon taxes on a smaller base. In perspective, BC’s carbon tax of $30 per tonne is 6.67 cents per litre at the pump, a small percentage of market price for gasoline. Other provincial fuel taxes are more substantial, ranging from 14.50 cents per litre in most of the province to 25.50 cents in the South Coast. On a per capita basis, again we see the recession-induced drop in 2009 and 2010, then increases from 13.5 tonnes per person in 2010 to 13.7 tonnes per person in 2013. If we just look at energy emissions, the increase is from 11.0 tonnes per person in 2010 to 11.4 in 2013. Even more narrowly, transportation emissions bottom out in 2011 at 5.0 tonnes, then grow by 8% to 5.4 tonnes per person in 2013. So basically, let’s cut the crap about BC’s carbon tax. The impact of the carbon tax has been overstated by people who love carbon taxes, and it’s annoying that the tax has generated so much uncritical praise. The carbon tax has also given extensive green cover to a BC government that has overseen a massive expansion of fracking gas production, with plans to drop several carbon bombs, if it gets its way, in the form of LNG export terminals. Indeed, developing an LNG industry would make it impossible for BC to meet its legislated GHG targets. I say all of this as someone who likes carbon taxes. A well-designed carbon tax can be the engine of a green industrial revolution — it can propel climate action from public and private sectors because it raises the cost of emitting carbon dioxide and other greenhouse gases, and provides the revenues needed to make public investments that reinforce climate action. A challenge in moving away from fossil fuels is that companies are putting billions of dollars on the table for their investments. The carbon tax is an ideal source of revenues to support alternative investments in needed services and infrastructure. But that’s not what’s happening in BC. Most of the carbon tax revenues (2/3) have been in support of corporate income tax cuts, plus 17 per cent to personal income tax cuts, 12 per cent to a credit for low-income households, and small amounts for a bunch of boutique credits, some of which have nothing to do with carbon. The low-income credit, in particular, offset the carbon tax for the bottom 40% when it was first introduced in 2008, but as the tax has gone up, the credit has not, making that whole regime regressive – that is, low-income households pay a greater share of their income to the tax than higher-income households. This “revenue neutrality” is deemed a feature of the carbon tax regime, but it’s actually a bug. Unlike economists, ordinary people don’t get the intuition behind revenue neutrality, and it’s a lost opportunity to fund the green infrastructure we need. In all, BC’s experience with a carbon tax is not black and while. It holds lots of lessons for other jurisdictions. To be truly effective, carbon taxes will need to be much higher than BC’s current rates. Before we go there, we need to fix some basic design problems. Putting BC’s carbon tax on a pedestal as a “textbook case” while ignoring its challenges and contradictory provincial policies is not helpful.